First step for your lanyard is to choose a type. Below are the four most common materials, but if you are looking for something special be sure to let us know! Silkscreened Flat Lanyards | Constructed out of ﬂat ribbed polyester material. PMS ink and material color match available. Digitally Sublimated Lanyard | Constructed out of polyester webbing, it lays ﬂat and feels soft and smooth for comfort. This lanyard provides unbelievable detail in full color and with clarity. This deluxe lanyard is crafted from a ﬁne woven ribbon with up to 12 thread colors and sewn onto heavy-duty, stock color poly-pro webbing. Coarse Weave Lanyard | This coarse weave, V-neck lanyard is made of polyester and features your logo woven directly into the material. Choose 1 background color and 1-2 logo colors! 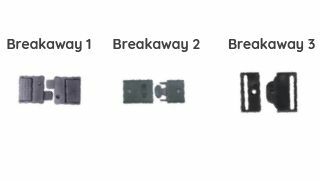 Strap thickness can range from 3/8’’ to an 1”. However, the more common widths are 5/8” or 3/4”, a perfect size for pins or addons. Accessorizing your lanyard is the best part of the whole process! From clips, bottle openers to badge reels, this is where your unique features really shine. Take a look at the options below and feel free to mix and match! For safety reasons, we recommend that your lanyard always includes this feature! 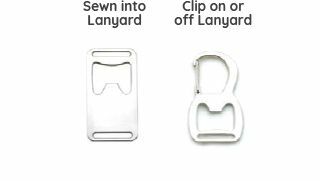 If your lanyard gets caught, this snap at the back of your neck will release and free you from the lanyard. 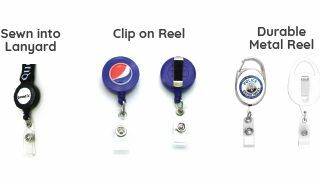 Add a badge reel to any of our lanyards and you have a retractable pull cord for your badge. No more bending over to scan your badge! All are available in full color.